— switchgames.com is a new online trading site (U.S. only) for swapping video games. You pay $6 if your offer is accepted and you get a postage-paid shipping label. 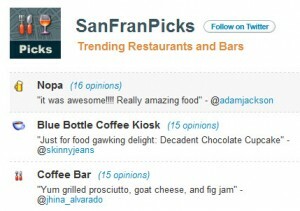 — schmap.com/picks tells you what restaurants and bars are being recommended by Twitter users. It covers 11 U.S. cities plus London and Sydney. The San Diego suggestions don’t mesh with those of our man on the ground. Bob used to think the Old Town Mexican restaurant in San Diego’s Old Town area was the best restaurant in the world. But our man in San Diego says it has really gone downhill. Other twitters say it’s still tops.